So we have another weekend of wrestling action taking place over the next three days and it wouldn't be fair to just focus on a few. That being said we're going to have a quick look at all the shows taking place over the weekend so everyone gets a little bite of the cherry. Now let's get Ready For The Weekend! 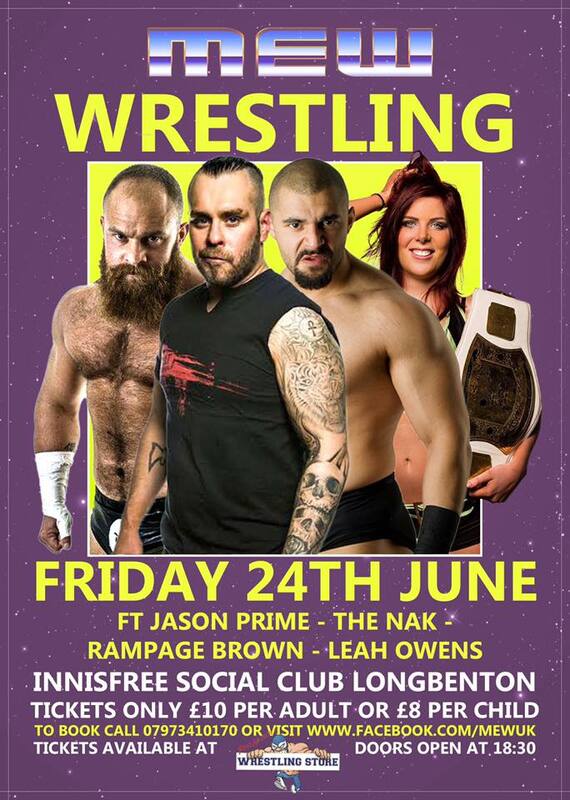 First up tonight, that being Friday, World Wide Wrestling League kick off their summer tour in Portree all the way up in the North West of Scotland. No matches or stars have been announced for the show so far but W3L will be looking to start their tour off with a bang. 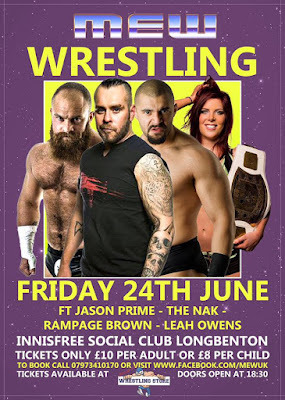 Back down in Newcastle-Upon-Tyne at the Innisfree Sports & Social Club in Longbenton, Main Event Wrestling will be holding their 'Toon Tussle' event. The show shall see the eponymous Toon Tussle match where the winner shall receive a championship match. It's a stacked match with Rampage Brown, Liam Lazarus and the current MEW Tag Team Champions; Micky The Dragon and HT Drake all competing. The event will also see three championship defended as Jason Prime is challenged for the MEW Championship by BT Gunn. Elsewhere, Alexander Henry shall make his first defence of the MEW North East Championship against Assassin. Little Miss Roxxy will also be fighting for gold when she challenges Leah Owens for the RQW Women's Championship. Friday shall also see Over The Top Wrestling return to Limerick at Dolans Warehouse. The show will feature Colt Cabana who has been challenged by The Gymnasties. What the challenge is, is anyone's guess but we'll find out tonight. 'The Mexican Sensation' El Ligero will also be in action when he faces former OTT No Limits Champion; 'The Bruiserweight' Pete Dunne. And if that wasn't enough to get you through the door, The Wards will be facing The Kings Of The North in a big six-man relaxed rules tag team match. Moving on to Saturday and Preston City Wrestling will be hosting their annual Tribute To The Troops event, this year taking place at the Preston Guild Hall. As always, the show is packed with international names and this will be the first event PCW have hosted that shall be broadcast worldwide in iPPV. After winning the There Can Only Be One gauntlet match, Drew Galloway will be challenging Sha Samuels for his PCW Heavyweight Championship. The feud between The London Riots and Team Single will rage on as they meet once again in tag team action in the hope of ending their disputes (though it's doubtful!). The team of Billy Gunn and Ken Anderson, affectionately known as the New Age Assholes will be competing against The Hooligans' Roy & Zak Knight. Lionheart will be stepping in the ring with Rob Van Dam while there shall also be women's action when Toni Storm faces Carmel with a threat that Saraya Knight may be in the vicinity of the event. W3L will continue their summer tour with one of their biggest events of the year, '7 Deadly Sins' at the Kirkclady Leisure Centre. The show will see Kevin Williams challenge Joe E Legend for the W3L Heavyweight Championship. The event will also see the 7 Deadly Sins tournament where 7 wrestlers will compete in a one-night tournament. 4 Front Wrestling will be in action this weekend when they head to one of their regular venues at the Thatcham Catholic Hall. While no matches have been confirmed, 4FW are well known for their great family friendly shows and this event shall likely be no different. HOPE Wrestling will be making their debut on Dunstable this Saturday and have announced two matches for their event so far. Firstly, Ashley Dunn shall be facing the undefeated, Joey Ozbourne. The main event shall see a triple threat match take place with Mark Massa, Gene Munny and Chris Tyler all fighting it out. Grapple Wrestling will be hosting an event on Saturday which will showcase a number of their academy students. One match on offer will be see Nsereko defending the Grapple British Championship against Liam Lazarus. B.A Rose and Seb Strife shall be competing against each other in singles action will six-person tag team action will see Ward 13 facing Jack Star, Ruby Summers and a mystery opponent. House Of Pain Wrestling will be holding another one of their weekend long set of events. They'll be in St Anns, Nottingham. The first show which takes place this Saturday will see Gabriel Kidd defending the HOP Heavyweight Championship against Alton Thorne while Warwick shall be challenging Tommy Taylor for the HOP Full Throttle Championship. Danny Chase and Kyle Kinglsey have been fighting back and forth for months now in a Best Of 5 Series. They're tied at two wins each so this fifth match will be the decider. The match has such significance that HOP have inserted Joseph Conners as the special guest referee to oversee the contest. Pro Evolution Wrestling are in Bristol at the Longwell Green Community Centre. The show will see The Bristol Boys defend the EVW Tag Team Championship against former champions, The Renegades while other regular EVW stars will be in action. Britannia Wrestling Promotions will be holding the first BWP Young Dragons tournament this Saturday in Denbigh at the Town Hall. The tournament shall consist of 4 competitors each with Lana Austin, April Davis, Lizzy Styles and Violet Vendetta participating in the women's tournament while the men's tournament will see Ethan Beach, Soner Dursun, Troy McCarthy and Drew Parker competing. Finally on Saturday, Over The Top Wrestling will be in action for the second time this weekend when they head back to the Tivoli Theatre in Dublin. While Colt Cabana will be making his debut on Friday, he could be leaving OTT on Saturday with gold when he teams with Workie to face The Gymnasties for the OTT Tag Team Championship. Luther Ward shall be facing 'The Beast Of Belfast' Big Damo in what is bound to be the definition of hard hitting. Martina will also be in action in Dublin when she faces Katey Harvey while a triple threat match between Ryan Smile, Tyler Bate and Jordan Devlin is scheduled to take place. On Sunday, W3L will be in Dumfirmline at the High Valleyfield Community Centre for the third stop of their summer tour where Joe E Legend shall be in action. Whether he will still be the W3L Heavyweight Champion or will be a former champion by then is still to be seen. PROGRESS Wrestling will be hosting an event for the second week in a row when 'Chapter 32: 5000 To 1' takes place at The Electric Ballroom in Camden, London. The show is already sold out and you can see why when Marty Scurll will be defending the PROGRESS Championship against Tommy End. There will also be two Atlas Championship tournament matches taking place as Damo O'Connor face Rampage Brown and T-Bone joins forces with Dave Mastiff to face Big Daddy Walter and Iestyn Rees in a tag team match. Jinny will be in action as well as she will face her former PA, Laura Di Matteo in a match that is filled with bad feelings. Johnny Gargano will also be in action this Sunday as he'll be defending the SMASH Championship in an open challenge. The second show of HOP's weekender will take place in Calverton, Nottingham at the Working Men's Club. There are six matches set to take place such as Danny Chase facing Lucas Archer and tag team action between the teams of Johnny Concrete and Alex Gracie and Garrett Bond and Barricade. HOP Heavyweight Champion; Gabriel Kidd shall also be competing when he faces Steven Harris in singles competition. And finally on Sunday, Kamikaze Pro will celebrate their third anniversary at the Meadway Sports & Social in Birmingham. The event will see all three championships on the line with Robbie X defending the Kamikaze Pro Championship against Clint Margera in a Tables, Ladders & Chairs match. Elsewhere, Ryan Smile's Relentless Division Championship will be on the line a four-way match including Omari, Tyler Bate and Chris Brookes. The Bigger Picture's Marshall X and Damian Dunne will look to add to their gold collection when the challenge The Hunter Brothers for the Kamikaze Pro Tag Team Championship in a ladder match. Not to mention that Jonny Storm, Dan Moloney, El Ligero, Lana Austin, Jody Fleisch, Alex Windsor and Pete Dunne will all be in action as well.